FILE - Saudi Arabia's Crown Prince Mohammed bin Salman is seen during a meeting at the United Nations headquarters New York, March 27, 2018. Crown Prince Mohammed bin Salman, Saudi Arabia's de facto ruler, once said he feared, "I am going to die without accomplishing what I have in mind." As evidence mounts linking him to the suspected murder of Saudi journalist and dissident Jamal Khashoggi, who vanished two weeks ago in his country's consulate in Istanbul, that fear may turn into prophecy. With a growing list of big businesses and governments withdrawing in protest from a much-trumpeted investment conference set for next week in the Saudi capital, Riyadh, analysts say Crown Prince Mohammed's pledge to usher in a new Saudi Arabia and to drag the conservative kingdom into the modern age looks to be in serious jeopardy. Next week's investment conference, "The Future Investment Initiative," is being hosted by the crown prince, whom many suspect ordered Khashoggi's killing. Billed as "Davos in the Desert," the conference is meant to showcase the crown prince's reform plans for economic and social modernization, called Vision 2030. 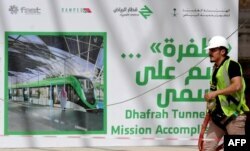 It aims to reduce Saudi Arabia's dependence on oil and provide new jobs in sectors unrelated to fossil fuel, upon which the kingdom's wealth has been based. FILE - A worker walks past a giant poster at a construction site of a section of the Saudi capital Riyadh's $22.5 billion metro system, May 4, 2016. Crown Prince Mohammed bin Salman announced a long-term reform program, dubbed "Vision 2030," marking the beginning of a hugely ambitious attempt to move Saudi Arabia beyond oil, the backbone of its economy for decades. The crown prince's project to update the kingdom, diversify its oil-based economy and slacken Saudi Arabia's Wahhabist underpinnings is dependent on foreign backing and investment; but, a growing boycott of the conference by Western firms is being seen as a substantial blow to the prince's agenda. And a long-term boycott of the kingdom could derail Vision 2030 — risking his own power by giving rivals within the royal family the opportunity to oust him. Some major companies, including Pepsi and EDF, say they still plan to attend, despite mounting pressure for a boycott. British defense firm BAE Systems and Arm, a microchip company, are facing calls from opposition politicians and rights activists to pull out. German consultancy firm Roland Berger, a co-sponsor of the three-day event, says it is reviewing its position. More than 30 high-profile delegations have dropped out since Khashoggi disappeared. Goldman Sachs says none of its executives will be there. The banking giant HSBC, Uber and the International Monetary Fund are all shunning the conference. The CEOs of JP Morgan Chase & Co, Blackstone Group, BlackRock and the chairman of Ford also have pulled out of the event. More are expected to follow — especially in the wake of Thursday's announcements that U.S. Treasury Secretary Steven Mnuchin and Britain's international trade secretary, Liam Fox, won't be attending. "This incident is unacceptable and clearly they [the Saudis] have to answer questions specifically regarding this incident," Goldman CEO David Solomon told CNBC. "How they answer those questions and how more information becomes apparent will have an impact on how we all interact." Goldman was recently hired by the Saudis' main sovereign wealth fund to advise on the sale of its majority stake in Saudi petrochemicals giant Saudi Basic Industries, according to Reuters. 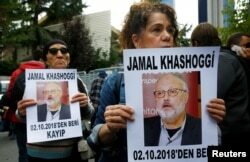 FILE - Human rights activists hold pictures of Saudi journalist Jamal Khashoggi during a protest outside the Saudi Consulate in Istanbul, Turkey, Oct. 9, 2018. British lawmaker Angus MacNeil, the chairman of an international trade committee in the House of Commons, also has urged other British companies to boycott the event. "The behavior of Saudi Arabia is utterly beyond the pale. They cannot operate with such savage impunity." The boycott suggests there could be long-term damage to the crown prince's reform project, even if Western governments refrain from imposing sanctions on Saudi Arabia for the suspected murder in the consulate, analysts say. He and Saudi Arabia may be too toxic for well-known brands and global businesses to work with in the wake of what befell Khashoggi. Turkish officials say 15 Saudi assassins flew in from Riyadh, cut off Khashoggi's fingers, decapitated him and dismembered his body shortly after he arrived at the consulate two weeks ago to collect divorce documents enabling him to marry his fiancee. Saudi officials deny he was killed, but have yet to explain his disappearance. 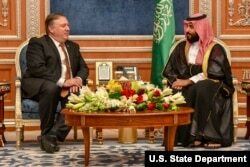 FILE - Secretary of State Mike Pompeo meets with Saudi Crown Prince Mohammed bin Salman to discuss the disappearance of Saudi journalist and dissident Jamal Khashoggi, in Riyadh, Saudi Arabia, Oct. 16, 2018. Some are wondering whether the kingdom's 82-year-old monarch, the ailing King Salman, may be forced to replace the crown prince as Saudi's day-to-day ruler, if the international outrage over the suspected killing risks causing a major rupture between the kingdom and the U.S. and Europe. "There is no doubt that the disappearance and likely death of Jamal Khashoggi will now damage Saudi Arabia's relations with the U.S. and Europe, should Riyadh be found responsible," said Neil Quilliam, an analyst at Britain's Chatham House. The crown prince's fate could be determined by the scale of the damage. So far, aside from expressing outrage Thursday about Khashoggi's disappearance, President Donald Trump acknowledged for the first time the likelihood Khashoggi was dead, saying it "certainly looks" as if he is — Western governments have been cautious about saying what they might do in response. Trump promised "very severe" consequences if it is proven the Saudis killed him. The U.S. and other Western governments say they want to reserve judgment until Saudi Arabia and the Turks have completed their respective investigations. The pause, some friends of Khashoggi complain, appears designed to give Riyadh an opportunity to fashion a narrative that points the finger away from the crown prince, possibly to offer a story that the suspected killing was a rogue intelligence operation gone wrong and was aimed at abducting Khashoggi rather than killing him. A journalist shoots video behind barriers blocking the road leading to Saudi Arabia's consulate in Istanbul, Oct. 19, 2018. The New York Times reported Thursday that Saudi authorities are considering blaming Maj. Gen. Ahmed al-Assiri, a high-ranking intelligence official, for the killing of Khashoggi in a bid to deflect blame from the crown prince, whom U.S. intelligence officials say they increasingly are convinced did order the murder. Other possible fall guys have been reported by other media outlets. That may not be sufficient to calm the international outcry. Nor may it be enough to persuade major international brands to continue to do business with Saudi Arabia while Mohammed bin Salman remains crown prince. Billionaire businessman Richard Branson, founder of Virgin Group, already has frozen business links with the kingdom and halted discussions with the Saudis over investment in its space projects. Branson has said if the allegations prove true about the suspected Khashoggi killing, it "would clearly change the ability of any of us in the West to do business with the Saudi government." Other British business executives have told VOA they harbored concerns about the crown prince before Khashoggi disappeared, mentioning their worries about what they see as his impulsive nature, his crackdown on dissidents in the kingdom and the aggressive foreign policy methods he has employed in the Gulf, including the bombing of civilians in Yemen. They say in the past they were ready to push aside their worries. Now it will be harder to do so. "Khashoggi's disappearance brings home the rogue personality of the crown prince," said a British CEO, who asked not to be named.